Delightful Repast is subtitled "A Tradition of Comfort Food with Flair." In my family, that tradition includes what my maternal grandmother called "a proper cup of tea." It is nearly impossible to get such a thing in the U.S. without doing it yourself. Most restaurants give you a tiny stainless steel pot of water that has been warmed, not boiled, on one of the burners of their coffee maker, along with a teabag of uncertain quality for you to dunk into the tepid water. The result is so insipid that people who have never had properly made tea think they don't like tea. Though I enjoy many types of herbal infusions, they are not tea; they are tisanes. I sometimes enjoy a green tea or oolong or some of the specialty teas that have recently come to the fore. But when I say "a proper cup of tea," that means a good black tea, such as Darjeeling, Earl Grey or English breakfast--organic, if possible. I usually prefer loose teas, but occasionally use teabags. I particularly like the "sachets" from Harney & Sons. Not only can you see the quality of the tea through the fabric, there is room enough for the tea leaves to unfurl properly. I had the pleasure of having afternoon tea with the charming John Harney (the Harney of Harney & Sons) last September when he gave a presentation on my favorite subject to a small group of tea aficionados. His knowledge of tea is amazing! You will need a tea kettle and a ceramic teapot, both of a capacity to make the quantity you desire. 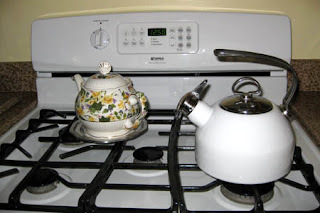 I have a 4-quart kettle and a 3-quart teapot for large crowds, but I mostly use my nearly 30-year-old 1.8-quart white enamel-on-steel Chantal Classic tea kettle and one of my average-size teapots. Everyone loves the Chantal's two-tone Hohner harmonica whistle! To make a proper pot of black tea, just before a kettle of freshly drawn water comes to the boil, warm the teapot with hot water, empty it, add one teaspoon of tea leaves for each 8 ounces of water. Immediately (that's why the teapot is on the stove in the photo above) pour in the freshly boiling water, let it stand for 5 minutes, stir, and then strain into cups. If you prefer to use a tea ball, be sure it is large enough to allow the tea leaves to unfurl. Serve with sugar or sugar cubes, thin slices (not wedges) of lemon and a small pitcher of milk (never cream). A proper cup of tea and a warm scone (scone recipe) make a delightful repast! Well written thankyou. Moved back to a house with gas. I like a real flame under my kettle. Thank you, Peter. I, too, like a real flame under my kettle (why I don't have an electric one), but I've never heard anyone else say so. Em, thank you so much! Yes, tea is wonderful. And a big part of my life. If you put "tea" in the search box just below the "Welcome" on the page, you will get a listing of every post that pertains to tea. I hope you will enjoy ALL of them and leave comments. And do tell all your tea-loving friends about my blog! It made me smile to see you mention your grandparents. If you read my FAQ, you'll see how very important to me my grandparents were. Vic, thank you so much! Anything we can do to promote the tea "cause," eh? I usually only have tea when I'm not feeling well ... I'm too much of a coffee addict to have it more often than that. That being said though, I love to use loose leaf and a gold Teeli brew basket and I usually go the herbal or tisane route ... since it's usually an upset stomach that I'm trying to calm down. Thanks so much, Chase! I'm definitely a tea addict, but I enjoy the occasional cup of decaf coffee away from home, usually in the form of a nonfat decaf hazelnut latte or just a plain cup of black. Smells wonderful, that's for sure. The aroma is hard to resist. Hmmm ... I don't know what to tell you. Do you keep your tea - either loose leaf or bags - in an airtight tin? Perhaps you could use extra tea, a teaspoon and a half rather than a teaspoon? Do let me know if you sort it out. Yorkshire Tea and their Yorkshire Gold are stronger teas than most. You might try them. Jean: I found your blog via the comment you left on my blog. I enjoyed your post about "the proper cup of tea". A couple of comments: 1) apart from the fact that those little stainless steel pots they give you in North American restaurants and cafes don't keep the water hot, they also invariably dribble terribly from the spout; 2) you mention adding sugar to a cup of tea - I used to do that, too (a habit I picked up as a young kid in England), but I finally read George Orwell's humourous essay about making tea, in which he says you shouldn't add sugar to tea because it masks the subtle flavour of the tea itself (and if you're drinking Earl Grey or Darjeeling, it's the flavour of the tea you really want, not the overpowering flavour of the sweetening agent); I realized he was correct, and stopped using sugar entirely. Best wishes! Hello, Clive! Glad you found me. Your friend Tony is a frequent commenter on my blog. Yes, I too hate a dribbly spout; in fact, I wrote a guest post on that very topic: http://www.smittenbybritain.com/how-to-avoid-teapots-with-dribbly-spouts/ And I agree with you (and George) about the sugar. I don't sugar my tea either. Just plain most of the time and occasionally a small amount of milk. And I don't like lemon in my tea. Hello! Thank you for inviting me to nose around your kitchen. And now I really want a cup of tea! And I hope you had one, Mrs T! I'm having a cup of Earl Grey at the moment. I've never met a cup of tea that was too hot for me yet. One of my friends says I have an asbestos mouth. I've usually finished a cup before she's even had a sip, still waiting for it to be not too hot! I've added a bit of cold water to her cup before, but I like your idea of popping a metal spoon in for a few moments. Hi dear Jean...Thanks for sharing not only your tea but your sympathy!Have a lovely weekend! Thank you, Maristella! Best wishes. I have never seen a teapot that big! It would sure be heavy to lift. Thanks for sharing good basic instructions which are so important. Thanks for sharing. It sure is, Bernideen! That's why I never use it. I need to get it down off its high perch and take a photo of it for the blog.